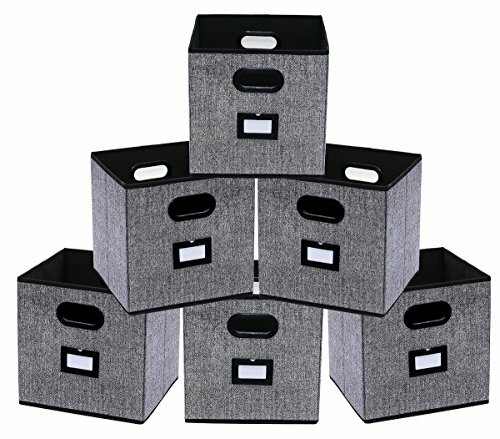 This set of 6 Onlyeasy Collapsible Fabric Storage Bins are perfect for organizing and cutting down on clutter, they will always have your toys, books, CDs, clothing, towels, and small personal items conveniently organized. Double handles for easy to slide in and pull out from your closet shelves. Meanwhile, you can fold them flat for space saving when not in use. These collapsible storage boxes are terrific choices in functionality and stylish. - Please do NOT washing them in water, you can use a small brush to clean the surface slightly if there are stains, then put the boxes in ventilated place until they are totally dry. - The material is durable, it is perfect for home clutter organizing, but do NOT use it with super heavy things, treat it gently. - Sunshine is warm but it will cause fabric ageing, so keep it AWAY FROM strong sunlight and extend its service life. FIT FOR SEVERAL STUFFS - This Storage Box Set is perfect for clothes, toys, magazines, art & craft supplies, or other small personal items for home, office, nursery or car. STURDY & DURABLE CONSTRUCTION - No smell and heavy metal, environmentally friendly. Made from 100% polypropylene Non-woven Fabric and 2mm Thick Cardboard, this storage bins set will meet your long term storage needs. SPACE SAVING STORAGE BOX - A set that includes 6 storage bins offers roomy storage space for your place, and also can be folded flat to save space when not in use. CONSIDERATE DESIGN - With Double Plastic handles for easy carrying, and easily to find what you need by Leather Label holder. Unfold size 12x12x12 inch makes it fit for all cubes or closet shelves. Brand: Onlyeasy - THE BEST CUSTOMER SERVICE - If for any reason you're not completely happy with your purchase - if it breaks, if it's damaged in shipping, or even if you change your mind - simply let us know and we will either replace it or refund your money, your choice! If you have any questions about this product by Onlyeasy, contact us by completing and submitting the form below. If you are looking for a specif part number, please include it with your message.